In business since 2007, our 10,000 square foot store is filled with beautiful displays of antique furnishings, shabby chic home decor, retro clothing, western wear and collectibles. Along with vintage collections and fun memorabilia, we guarantee a pleasurable trip back in time. you are sure to love our boutiques' new pottery, metal sculpture, soft goods and kitchen woodenwares. makes truly unique gift. One of our talented designers will assemble a beautiful custom basket with your favorite treasures while you shop. is now on Facebook. See us there, look around our site and join our mailing list and stop back often for the latest vintage finds, more photos upcoming events. 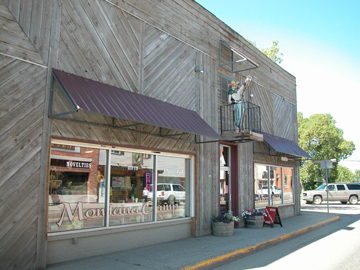 Easy to find at 26 East Main Street in downtown Belgrade, Montana, watch for Margie, Montana Camp Cowgirl©, waving from her balcony over our entrance. Across from The Mint Bar & Cafe, Montana Camp has convenient, free street parking. Open 7 days a week for your antiques shopping pleasure, see our store hours. Street parking is free and convenient.